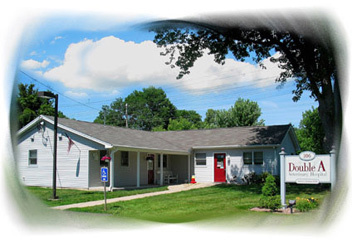 Double A Veterinary Hospital is a full service veterinary facility that has provided the finest professional health care since 1997. With modern and specialized equipment, our hospital is prepared to meet your pet's individual needs. We also have the ability to offer in-hospital referrals to veterinarians who specialize in orthopedic surgery, ultrasound, endoscopy, cardiology, etc. The staff at Double A Veterinary Hospital is committed to excellence in improving the quality of life for your companions. They are, after all, members of your family - so we treat them like members of ours. Our mission is to provide clients and their pets with progressive and compassionate veterinary care at reasonable fees, in a pleasant, efficient and friendly atmosphere. At this site, you will find information about our practice philosophy, our services, helpful forms to assist you and an extensive Pet Medical Library for you to search for additional information. You can also refill your pet's prescription online.Just go to the Rx Refills page and fill out our form. Feel free to browse through our site. If you have any questions about this website or our practice please go to the Contact Us page and use one of the convenient methods to communicate with us.